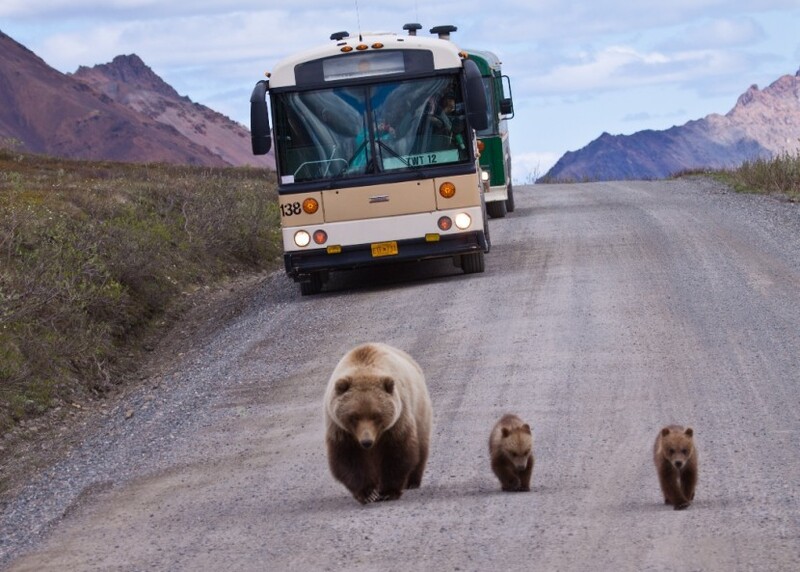 Bear viewing is high on everyone’s must-do list in Alaska this summer. Fortunately, two Princess lodges situated at and nearby Denali National Park and Preserve offer the perfect jumping–off point for a weekend getaway into the wild. Only a five-hour drive from Anchorage and even closer to Fairbanks, the park is home to a multitude of bears and wildlife adventures galore; a stay at either lodge provides an ideal opportunity to meet them (from a healthy distance). The Denali Princess Wilderness Lodge is conveniently located just a mile from the entrance of Denali National Park and Preserve. Home to more than six million acres of wildlife and Mount McKinley, North America’s tallest peak, the park is roughly the size of Massachusetts! In addition to the mighty brown bear, the park is home to moose, caribou, Dall sheep, wolves, foxes and more. Guests can tour the park and view its furry inhabitants on the full-day Tundra Wilderness Tour or shorter Natural History Tour. Be sure and bring extra camera batteries — both tours give visitors a broad introduction to the park with ample opportunities for photos and video. A two-hour drive south of the national park, Mt. McKinley Princess Wilderness Lodge is located in Denali State Park. The lodge offers a more off-the-beaten path wilderness experience with convenient access to the national park bear-viewing tours. Its south side location of the park also provides travelers incredible views of Mt. McKinley, access to great hiking trails and the nearby Chulitna River, as well as a daily shuttle to the eclectic town of Talkeetna. Other outdoor adventures abound here with river rafting, boat safaris, horseback riding, flightseeing tours and even a stunning Mt. McKinley rail tour from Anchorage, Fairbanks, and either Princess lodge in between. Don’t have enough time to travel north to Denali? Don’t fret — you can still channel your inner bear (and certainly keep your eyes peeled for them) by taking up their favorite pastime: fishing! The Kenai Princess Wilderness Lodge and Copper River Princess Wilderness Lodge are located in Alaska’s Southcentral region and next to some of the best sportfishing locales in the state. The Kenai lodge location on Alaska’s Kenai Peninsula offers cozy, bungalow-style rooms with wood-burning stoves and private porches. Its nearby namesake, the Kenai River, is one of Alaska’s most sought-after fishing spots for anglers of all levels from around the world. The Copper River lodge is a four-hour drive east from Anchorage and is located near Wrangell-St. Elias National Park and Preserve, the largest national park in the country. Here, travelers can cast a line for the famous Copper River salmon, or take part in other adventure opportunities like rafting, flightseeing and more. Knowledgeable Princess staffs at both lodges are available to help arrange tours for guests. Whether it’s bear viewing, fishing or another activity you’re seeking this summer, Princess Lodges ensure an Alaska-sized adventure at any location!